How do you immerse someone into your company – before they’ve walked in the door? Showcase your culture, your leadership, your development opportunities and pathing. And pair your jobs with relevant content that tells your story. Your TalentBrew Career Site is the nucleus of your engagement strategy – filled with insights that captivate and inspire candidates to act. Jobseekers can imagine their first day of work with employee videos, 360-degree office tours, or even a list of the best lunch spots near the office – all in the context of the job that candidate is already interested in. With your TalentBrew Career Site, you'll be able to push jobs and content directly to candidates, create consistent brand messaging, track your success, tie in social media and pull in just the right hires. Using the latest in advanced search features, candidates can search related content at the same time as jobs within a responsive web design that delivers a seamless experience across all devices. Plus, passive candidates are easier to attract with interesting, entertaining content that makes them stop and take notice. The power of pairing compelling content with jobs. With meaningful content available right at the job level, you’ll have the ability to stage an authentic, unique experience for candidates that differentiates you from the competition. This way, the right candidates have the information they need to apply, sign up to receive text or email job alerts, or even opt out if they're not a fit. And we’ll make sure everything you show and tell job seekers is meaningful, impactful and on-brand. We'll work with you to leverage existing content, develop new content and curate appropriate third-party content to boost your message and showcase your company, culture and career opportunities to the right people at the right time. We can even create infographics and other dynamic content and leverage your employees to generate the authentic content that job seekers value most. An automated job feed that keeps your TalentBrew Career Site updated with the latest open job requisitions. Every day, jobs are imported from your ATS or scraped from your website via an XML feed and then rendered into searchable, branded web pages. Experience the latest in search innovation – technology that gives candidates the flexibility to change their search terms from within the search results page. Filtering allows candidates to pick and choose the options that best suit their needs. Job Alerts give candidates the ability to receive customized updates on job listings they are interested in. And the Job Alerts’ sign-up functionality can be customized to match the data you are looking to collect – giving you more options to personalize future communications. Capture candidates at the start of the application process to build your own talent community. 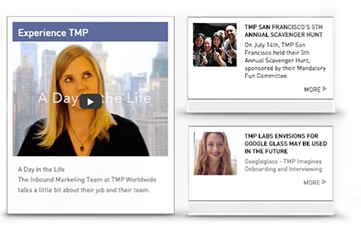 TMP's experts can then help you leverage, manage and communicate with this captive audience through Candidate HQ. Ensures the information available across the site can be customized at the job category to include a specific design, images, video and other related content. 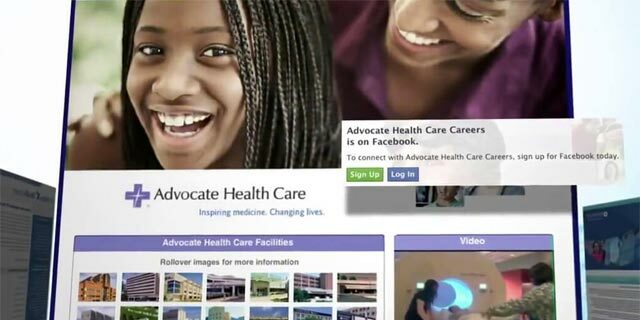 This design will ensure your entire custom-designed career site can be viewed on any device at any time. Increases the SEO visibility to the entire career site (jobs and related content) by integrating together and hosting on the same domain. Our team will take a deeper dive into your results and deliver quarterly analytics results to help you manage your campaigns and continuously improve. Delivers specific content, job details and candidate functionality to external sites, including Job Search and Related Jobs widgets, Content pages, and Rich Media ad units that bring TalentBrew functionality to candidates – no matter where they are. Add additional content for various initiatives – new locations, events, priority positions, etc. Let us help you tell your story through a TalentBrew Career Site that’s true to who you are – in an engaging web presence that connects you with the right kind of talent. View seamless integration of TalentBrews into existing career sites as "Search Jobs" sections. View TalentBrews as full career sites, complete with custom content pages (e.g., benefits page, locations page).